What was perceived as an inevitable move has been confirmed. Dynamic wide receiver Charles Nelson, has been listed as a defensive back heading into Spring Practice, per a University of Oregon news release. 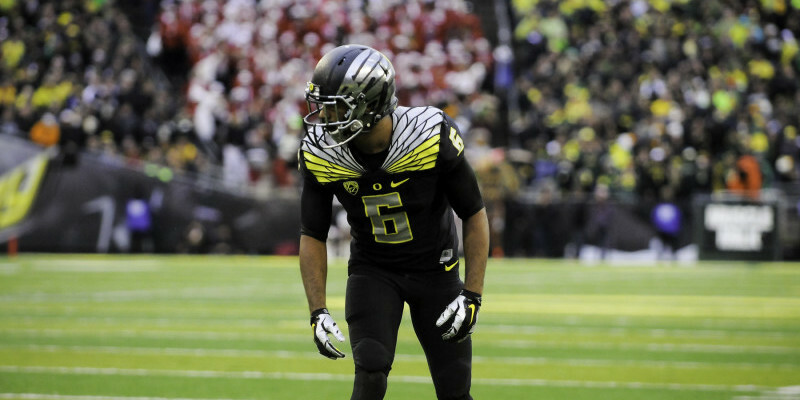 Nelson will bring a nice dose of physicality to the Oregon defense. The news is not shocking, though some people might question why Mark Helfrich and staff made the decision to move such a good wide receiver. With the amount of talent that the Ducks have on offense, with returning players and this year’s recruiting class, this shouldn’t necessarily be a surprise. Last year, Nelson made a name for himself all over the field, with his dazzling moves on offense and physicality on special teams. From a fan’s perspective, it can definitely be a bit frustrating. Nelson is so much fun to watch on offense, but his abilities will be put to better use on defense — or so it is hoped. With the amount of talent on offense this season, it will be difficult for everyone to get enough touches to keep them satisfied. This move signifies the trust and confidence that the coaching staff has in Nelson. Fans are used to a high-paced offense, and would like to see a stout defense to compliment that firepower. The loss of a few key players on defense will be tough, but defensive coordinator Don Pellum and staff will work tirelessly to make this defense the best it can be — and Nelson has the ability to help him reach that goal. Spring Practice is underway, and FishDuck.com is the place to be for all of the latest news and updates.